This was my contribution to the Clandestine Cake club gathering in Kilburn. It is an elaborate looking cake but is actually relatively easy with no difficult techniques to master, as long as your batter doesn’t curdle and you leave the oven door shut for 2/3 of the cooking time I think this recipe is pretty straight forward and looks great and tastes light, fruity and summery. I used duck eggs in the sponge for the first time, I was at home with my parents Mum said my grandmother always bought duck eggs for baking as they are richer and give cakes more oomph (technical term). The cornflour in place of some of the normal flour is also an heirloom tip to improve the texture of the sponge. This recipe can be scaled down by remembering that a basic victoria sponge has equal weights of butter, flour and sugar. Pre heat oven to 190 °C grease and or line two 8” cake tins. Sift or mix together the flour, cornflour and baking powder. With a hand mixer or plenty of elbow grease cream the butter and sugar until pale and fluffy. Then mix in half the eggs and flour, cornflour , once this has combined add the other the rest and mix again until it forms a stiff ish batter. This method should stop it curdling but if it looks as thought it is, add a little more flour and mix that in. Add the elderflower cordial and milk, the amount needed may vary but the batter should be loose and silky looking. Divide between the two cake tins and bake, it should take approximately 30 minutes at 190 °C but as my oven is temperamental it took longer and I had to cover the top of the cakes to stop them colouring too much, but you will know when they are done when the start to pull away from the sides of the tin and a skewer comes out clean. Turn out when cool enough to handle and cool full on wire racks. When cool spread jam over one of the sponges. Whisk together the elderflower cordial and cream until stiff and spread on top of the jam. Next layer on the fruit, neatly if you like or randomly, it doesn’t really matter. Then place the second sponge on top. 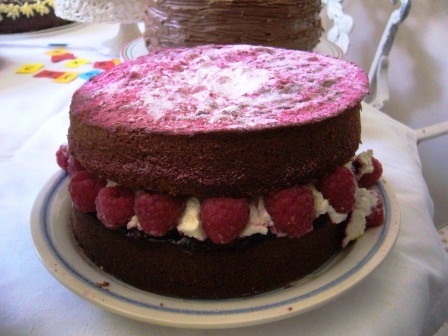 To make the top nice and pink ( and cover up any imperfections you might want to hide, push the icing sugar and dried raspberries through a sieve over the top layer. Voila. Lovely cake. 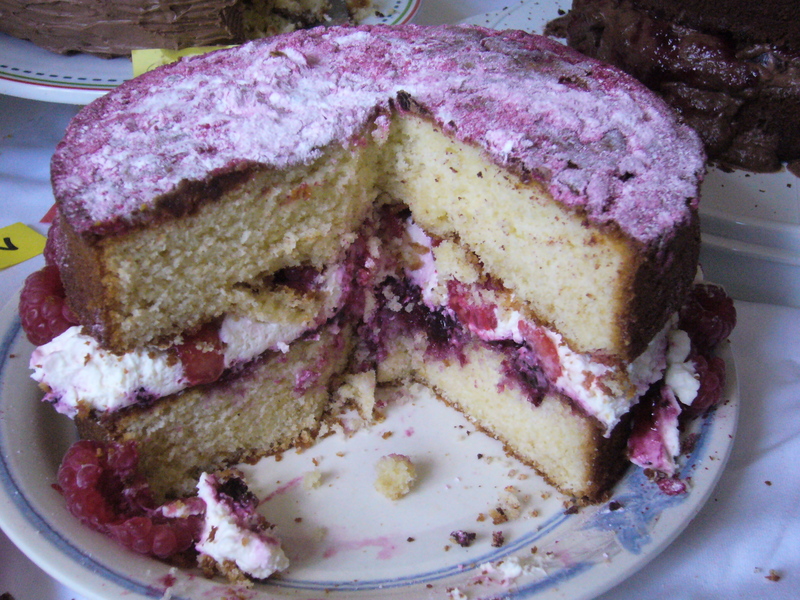 I’ve created a link from the Clandestine Cake Club so people can try your recipe. Thanks Lynn, timely too as it uses duck eggs! I tried this cake for my Mum’s birthday as it sounded a bit different. It was a great success, she absolutely loved it!!! Thanks for the recipe. Aww thats brilliant. Thanks for letting me know and so glad it went well and you Mum liked it. thanks for the pingback. I love Belvoir cordials too the ginger one is amazing.